Manufacturing processes for biopharmaceuticals have undergone significant changes over the past decade. 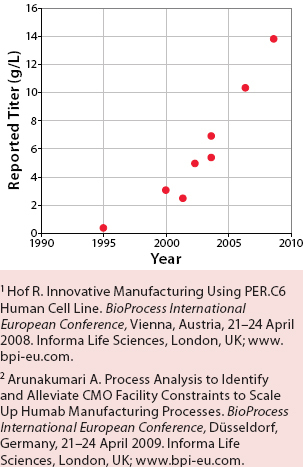 One of the most striking results of improved process sciences is the dramatic rise in expression levels from animal cell cultures. 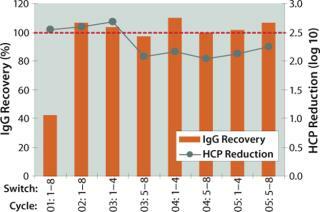 Figure 1 shows how some monoclonal antibody titers have increased about 30-fold over the past 15 years. These increasing titers have allowed current biomanufacturing facilities to produce larger product quantities than anticipated at the time they were designed and built. As a result of those increasing titers, the “bottleneck” in biopharmaceutical production has shifted from upstream production processes toward downstream processes (1). In particular, chromatographic capture is currently presenting significant challenges in terms of facility throughput. The mass of product that needs to be captured during each batch has often exceeded the maximum binding capacity of a single column, so capture columns generally are being cycled multiple times during a single batch. Installing larger columns is often undesirable or infeasible. An even more problematic bottleneck is encountered when fitting modern high-titer processes into existing facilities where buffer tanks and handling capacities are limited. Regardless of the number of cycles run, the required buffer and elution volumes in batch-capture chromatography increase with the mass of protein purified. The capacity of associated buffer preparation systems, buffer hold tanks, and intermediate product hold tanks is often too small to cope with the required volumes needed for larger amounts of product per batch. For such facilities, consequently, the driver to move toward a continuous-countercurrent chromatography process is mainly governed by the need to reduce buffer consumption and increase throughput or manufacturing productivity in the existing manufacturing space. New facilities are commonly designed around the current state of the art in manufacturing technologies. Particularly at the clinical manufacturing scale, a trend toward fully disposable manufacturing solutions is clearly visible (2). To make a disposable capture chromatography process economically feasible, companies need to obtain the same purification performance with a much smaller volume of media, thereby requiring a greater number of cycles per batch – perhaps enough to render the media “fully used” to its expected lifetime. Thus an entire chromatography process (including capture) could be economically disposable/single-use. For this case, we assume a batch of 1,500-L clarified cell supernatant with 3 g/L monoclonal antibody. The reference process is a batch capture process using MabSelect Sure media from GE Healthcare (www.gelifesciences.com) with a 42-g/L dynamic binding capacity under process conditions. Both the batch and BioSMB processes are designed to operate at 99% capture efficiency. The most relevant process data for both systems are shown below. To overcome capacity and/or economical bottlenecks in manufacturing, other process industries have implemented multicolumn chromatography processes. Use of multiple columns enables continuous countercurrent processing, which leads to more efficient use of chromatographic resins and reduces buffer consumption. Such systems are often referred to as “simulated moving bed” (SMB) technology because the movement of chromatography media is not actually pushed through the system, but rather simulated by periodically switching column inlets and outlets. Media are kept in packed columns that do not physically move, themselves. Although SMB sometimes exclusively refers to binary fractionations (as in glucose/fructose separations), we use the term for any type of multicolumn chromatography system in which the transport of media is realized by periodically switching column inlets and outlets to different parts of the process. SMB and related technologies have been successfully applied in many process industries, ranging from large-scale petrochemical refineries to moderate-scale pharmaceutical processes. Probably the best known use for SMB is in the separation of chiral molecules. Other well-known (large-scale) applications can be found in the production of high-fructose corn syrup, vitamin C, antibiotics, and amino acids such as l-lysine. These applications involve chromatography systems with up to several hundred cubic meters of resin installed. The driver for installing such systems in other process industries has mainly come from the need for cost reduction and very large-scale capacity applications. Such industries have commonly achieved savings of 40–60% in buffer and resin consumption and inventories by implementing continuous-countercurrent chromatography. Large-scale manufacturing normally involves a facility with six production bioreactors all connected to a single downstream processing suite. For this case, we assume that a facility yields batches of 12,000-L clarified cell supernatant with 3 g/L monoclonal antibody. The material needs to be processed in 22 hours. The most relevant process data for both scenarios are shown below. In case the BioSMB system was designed for a 46-hour processing time (assuming that one bioreactor is released every two days), it could be designed to operate with 10-L protein A media only, running 72 cycles per batch. With a 10-g/L titer in the cell supernatant, the system could run nearly 100 cycles per column per batch. For product capture, the principles of SMB technology can be applied to create a continuous-countercurrent process. The first column in a loading train is allowed to break through, and material coming off it is captured on a second column in the loading train. The binding capacity of the first column can thus be exploited well beyond its dynamic binding capacity. In many cases, such processes can be operated close to the equilibrium or static capacity of the chromatography media involved. That leads to significant improvement in media use – and hence a significant reduction in the consumption of media and buffers. Another advantage of using continuous-countercurrent loading is that the loading zone must only accommodate the mass transfer zone, which generally covers only a small portion of an overall chromatography column. This allows the entire process to be conducted in a much smaller system carrying only a fraction of the chromatography media used in a standard batch process. Tarpon Biosystems continuous processing systems use multicolumn chromatography to enable fully disposable continuous-countercurrent processing. This “BioSMB” technology is specially designed for biopharmaceutical applications and relies on the principles of SMB. Similar benefits can be achieved by applying the same principles as traditional multicolumn chromatography (or SMB) systems. For instance, a clinical manufacturing batch can run with eight or 12 smaller columns of 8-cm internal diameter (ID) and 5 L total protein A media instead of a single column of 40-L protein A media for a batch process (as detailed in the “Example 1” box). Similar advantages can be obtained in large-scale manufacturing (as in the “Example 2” box), for which a BioSMB system with eight small cartridges of 20-cm ID can purify the same amount of monoclonal antibody as a single 140-cm diameter column. 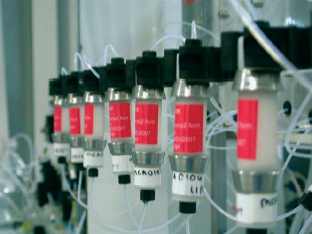 A BioSMB system relies on multiple chromatography columns (as shown in Photo 1) or other separations devices such as membrane adsorbers connected to a single integrated and disposable valve cassette (as in Photo 2) containing the valve seats of all valves needed to direct incoming and outgoing fluids. The valves in the cassette pictured are pneumatically actuated through a permanent actuation block that is an integral part of the BioSMB system. Regardless of scale, use of the proprietary disposable cassettes that comprise the wetted (product-contact) parts of all valves eliminates the need for cleaning between different batches or manufacturing campaigns. The use of small prepacked columns, disposable sensors, and peristaltic pumps enables an integrated, fully disposable fluid path. The BioSMB integrated valve cassette is designed with minimum dead volume in its valve seats. So the overall separation performance is optimized and can be maintained through any scale. Currently, these cassettes are available for laboratory-scale process development activities and clinical manufacturing. They can be mounted on the very same BioSMB system. For large-scale manufacturing (e.g., to purify output from 12-m3 or 15-m3 bioreactors), custom-made BioSMB systems are being designed containing larger valve cassettes. A BioSMB system is controlled by dedicated control software that provides operators with an overview of the current state of their processes and all signals recorded during operation. This involves UV/vis absorbance, conductivity, and pH of multiple outlets as well as pressure measurements at all inlets. The recorded signals show repetitive elution patterns, which provide users with a process performance “fingerprint.” The control software allows overlaying the signals of consecutive process cycles to verify whether or not the system is operating in a steady state. Figure 2 shows a typical graph of the signals from multiple consecutive cycles. Use of multicolumn chromatography for Protein A capture of monoclonal antibodies was successfully demonstrated a few years ago (3). But that work was performed on a carousel-type SMB system not easily adaptable to CGMP manufacturing. The BioSMB system successfully overcomes the disadvantages of that system by using a hygienic valve design in a disposable valve cassette. The prototype BioSMB system has been operated with IPA 400 agarose-based protein A media from Repligen Corporation (www.repligen.com) and POROS MabCapture A media from Applied Biosystems (now Life Technologies, www.appliedbiosystems.com). Both were packed in Disposable Format Chromatography (DFC) cartridges from BioFlash Partners (www.bioflashpartners.com). The cell supernatant was kindly provided by Biogen-Idec (www.biogenidec.com). We performed our first case study with IPA 400 media and a synchronous switching scheme, which requires all valves to switch at the same moment. Table 3 summarizes the results. The system was not fully optimized for minimizing specific productivity or buffer consumption. Nonetheless, the results already show significant improvements in specific productivity and a substantial savings in buffer consumption. The impurity profile of product derived from the BioSMB test is similar to that derived from a batch process. During the second case study using MabCapture A media, we implemented an asynchronous switching scheme. This allows further optimization of specific productivity and buffer consumption. Table 4 summarizes the results of this test. 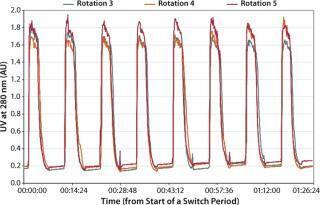 And Figure 3 shows that process consistency was maintained during multiple consecutive cycles. BioSMB technology is an open platform that can use any existing chromatography media and buffer system and relies on the same fundamental principles as batch chromatography. It can be used to improve the performance of existing affinity chromatography steps, such as protein A capture of monoclonal antibodies, as well as traditional ion-exchange (IEX) and hydrophobic-interaction chromatography (HIC) steps. Although this technology is developed as a truly open platform, combining it with prepacked columns also eliminates the need for packing multiple columns. Another advantage of using such columns is the consistency of their performance thanks to the reproducibility of the packed bed. In this respect, BioFlash DFC cartridges have shown to be an asset because they can be packed with any commercially available chromatography resin and come in any length, which is helpful for optimizing the number of cycles in the design of a BioSMB unit operation. The cartridges are supplied pretested and arrive with a certificate of analysis. Their consistency allows a BioSMB process to be designed to its optimum working point. Alternative chromatography formats – such as monolithic (CIM) cartridges, membrane adsorbers and expanded bed (EBA) chromatography – have also been tested successfully. In all cases, the multicolumn process showed significant improvement in specific productivity (expressed by the amount of purified material per volume of chromatography media per unit of time) combined with a reduction in buffer consumption. Like any continuous process, BioSMB technology offers more degrees of freedom and thus can be fine-tuned toward the specific needs of a given process environment. One very attractive feature is that the design is basically volume driven rather than mass driven. The volume that needs to be processed is the dominant factor governing equipment size, whereas the size of a batch chromatography column mainly determined by the amount (mass) of protein that needs to be purified. Therefore, BioSMB technology is more capable of handling increasing product titers. As long as the batch size (volume) and processing time remain the same, the sizing of BioSMB system hardware will not change. 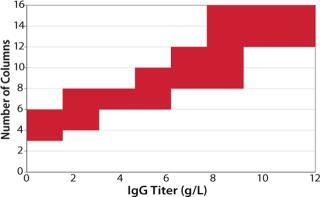 The number of columns needed to perform a continuous process will gradually increase as the titer increases because required buffer volumes vary with product titer. To allow sufficient residence time for other steps, the number of columns must be adjusted. This effect is shown in Figure 4, which indicates the number of columns needed to purify monoclonal antibody from a cell supernatant as a function of product titer. BioSMB technology addresses the limitations in retrofitting current facilities with high-titer processes by allowing the same manufacturing capacity with lowered buffer consumption than with batch chromatography. So facility throughput can be increased without major expansion of buffer-holding capacities and/or infrastructure. The footprint of a BioSMB system is generally smaller than that of a batch chromatography system (including the column). BioSMB technology also seamlessly fits into fully disposable manufacturing trains often envisioned for the (clinical) manufacturing facilities of the future. Conscious scheduling of manufacturing campaigns can even allow prepacked columns with protein A media to be used economically in a single batch. In multiproduct facilities, chromatography media can be economically deployed when dedicated to a manufacturing campaign, thereby minimizing logistics and saving warehouse capacity. 1.) Curling, J, and U Gottschalk. 2007. Process Chromatography: Five Decades of Innovation. BioPharm Int. 20. 2.) Froimson, J 2009. 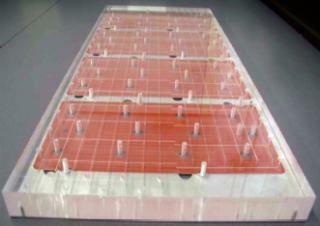 Disposables in Clinical Manufacturing. Amer. Pharm. Rev. 12. 3.) Thömmes, J 2003.Protein A Affinity Simulated Moving Bed Chromatography Recovery of Biological Products XI, Banff, Alberta.